Wireless connectivity enables you to find, buy, and read instantly;whether you're in the back of a taxi, at the airport, or in bed. 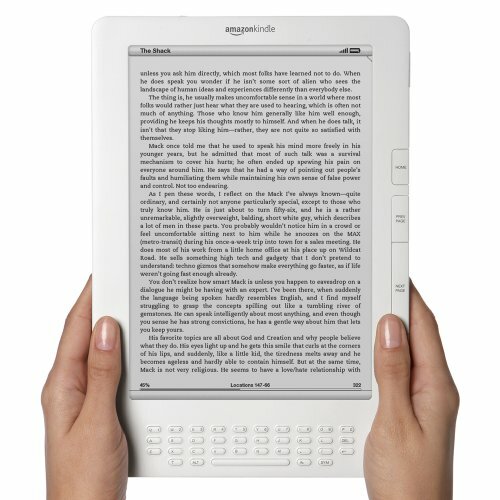 Shop the Kindle Store directly from your Kindle. Sleek & Trim Kindle DX is as thin as most magazines. Just over a third of an inch in profile, you'll find Kindle DX fits perfectly in your hands. International Coverage: Enjoy 3G wireless coverage at home or abroad in over 100 countries. Beautiful Large Display Kindle DX's large display is ideal for a broad range of reading material, including graphic-rich books, PDFs, newspapers, magazines, and blogs. Kindle DX's display is two and a half times the size of the Kindle display. Whether you're reading the latest bestseller or a financial report, text and images are amazingly sharp on the 9.7" screen. Auto-Rotating Screen By simply turning the device, you can immediately see full-width landscape views of maps, graphs, tables and Web pages. Built-In PDF Reader Unload the loose documents from your briefcase or backpack, and put them all on Kindle DX. From neighborhood newsletters to financial statements to case studies and product manuals--you can take them all with you on Kindle DX. Native PDF support allows you to carry and read all of your personal and professional documents on the go. With Amazon's Whispernet service, you can send your documents directly to your Kindle DX and read them anytime, anywhere. 5-Way Controller Kindle DX has an easy-to-use 5-way controller, enabling precise on-screen navigation for selecting text to highlight or looking up words. Simple to Use, No Computer Required Kindle DX is completely wireless and ready to use right out of the box--no setup, no cables, no computer required. Long Battery Life - Read for Days Without Recharging With Kindle DX's long battery life, you can read on a single charge for up to 4 days with wireless on. Turn wireless off and read for up to 2 weeks. Battery life will vary based on wireless usage, such as shopping the Kindle Store and downloading content. In low coverage areas or in 1xRTT only coverage, wireless usage will consume battery power more quickly.